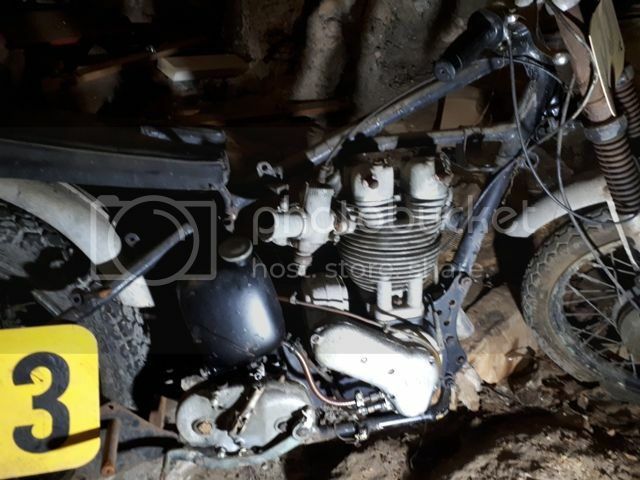 Now retired I have found the time to drag my 1951/52 Ariel VCH racebike out from under my house and start to rebuild it. Back in the pits I removed the head and it wasn't a pretty sight (I think my piston had a religious experience. It was now Holy. My mates said "Pissed an Broke"!) I was so upset about it I put it away and didn't look at it again until now. I was told by a few ex Ariel racers it was one of the few that came out to Australia, the engine serial number is TR117 which puts it as 1952 but the frame is a SA (1951 plunger). I will attempt to attached some photos. Probably Nev, will try it on E85, not sure what the difference is with bases. Attached photo, can someone tell me if is roundbase or whatever, I'm not up on specifics on this. Mine has a polished steel crank and elektron crankcases, I have a few cams (with big overlaps from Jack Carruthers and that he said worked well with that piston shape. Claude Cartledge made the first piston and some suggested it was re-cycled beer cans or made when the mould was very cold, he desperately wanted my engine and said he thought it was the spare one that disappeared after Bathurst 1952, the other engine had its crankcases separate and was trashed. Was it normal for the 500 singles to run double valve springs and valves that were so large they had barely any metal between the exhaust and inlet seats? My engine also came with a box of bits with a few different cam profiles and an MJM timing cover with a rotary oil pump fitted externally. The 108 mph I got down conrod was with a 17 tooth sprocket as the 21 tooth I was going to run dropped a tooth bump starting it in the pits. 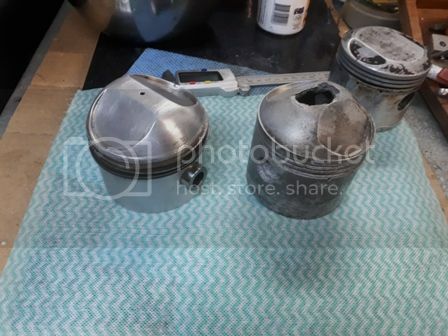 I revved right out past my expected redline with the 17 tooth so it would have pulled the 21 tooth ok.
May look at getting a JP HT piston to try as its will only be 9:1 (they couldn't provide a weight for it ) just be a lot more work to re-balance the crank if the weight changes too much. I will also have to drop my jet sizes down quite a bit with E85 on the GP3. Hopefully I can get a few gems of wisdom from the forum so I don't waste time and effort going in the wrong direction. Still haven't decided if it should be a racer or a road bike. Those JPs are a lot heavier and often lead to some re-working. There's quite a lot of discussions on pistons around here! There's no real point in making the exhaust valve a lot bigger. Later development had them smaller than the standard 52 models. 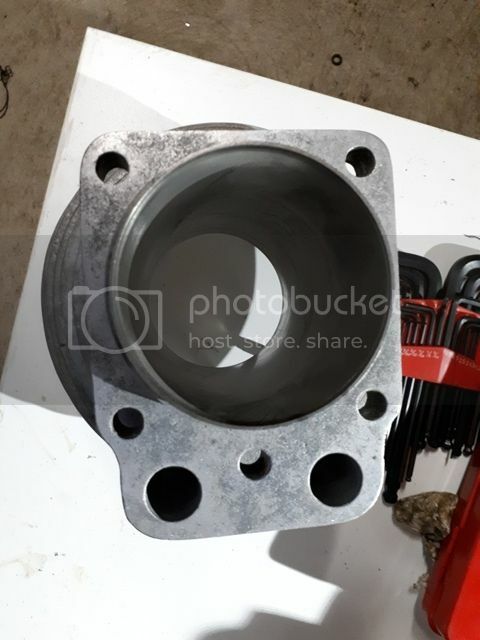 A high comp piston such as the one you have, may require a lot of ignition advance, as it has a poor combustion area shape (like an orange peel ) and reduces gas flow below optimum. The JP pistons are heavy. All the normal internals on the VCH at best are just standard VH parts. as I mentioned the "as sold" flywheels in that motor may have been cast Iron. There were quite a few later VCH's raced where the wheels flew apart. They also were a bit infamous for the mainbearing moving about in the electron crankcases when the motor got hot. The original 50 model with the roundbase motor used the small base two lobe cam as supplied in some VH models with offset push rods. The related castings in the head and barrell are offset and don't interchange with later alloy heads, easily without reworking. Yours may run the single lobe wide cam which wears better but I prefer the two lobe for performance possibilities.. Your motor should run alloy pushrods that sometimes get worn by the seals fitted to the head/barrel joint when they squeeze out of place.